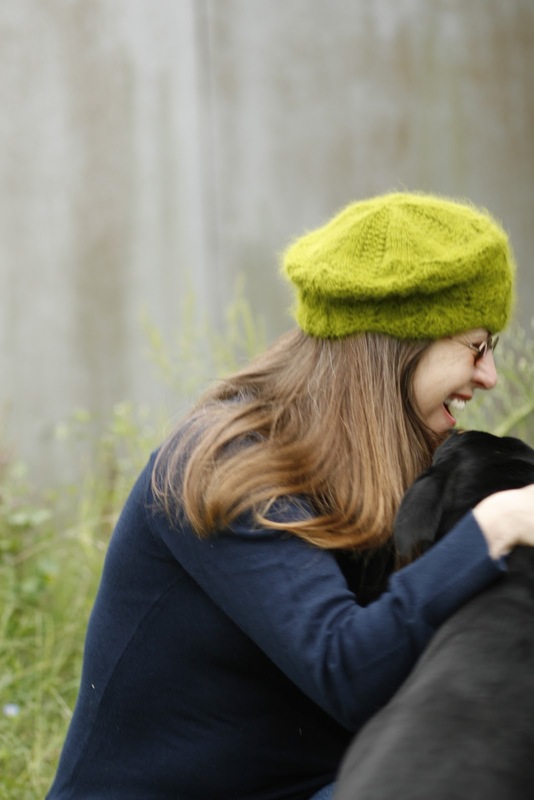 This morning was brisky – perfect for coffee, hand knit socks and even a quick photo shoot to show off the second blocking of the green chapeau from my friend Jessica. I love this hat! It makes me incredibly happy on so many levels. We went out after a late and leisurely breakfast and Chris suggested the back of the pole barn as a backdrop. There were basic shots taken before the dogs discovered us. In this beautiful autumn weather they become frisky and playful – over playful even! I ended up on the ground laughing and pushing doggies away. Tess is our pup, and you can see her a little in the top photo but Martha is the one who lets the others go race around insane and stays beside me for some attention. Anyone who’s known me for long knows my favorite color is green. It’s changed in shades now and then through the past five decades but it’s always green. My kind and generous friend Jessica sent me a hat I’m pretty crazy about it. This photo is after the first blocking – and now it’s got a bigger saucer it in shaping it into more of a beret. This hat rocks in so many ways. 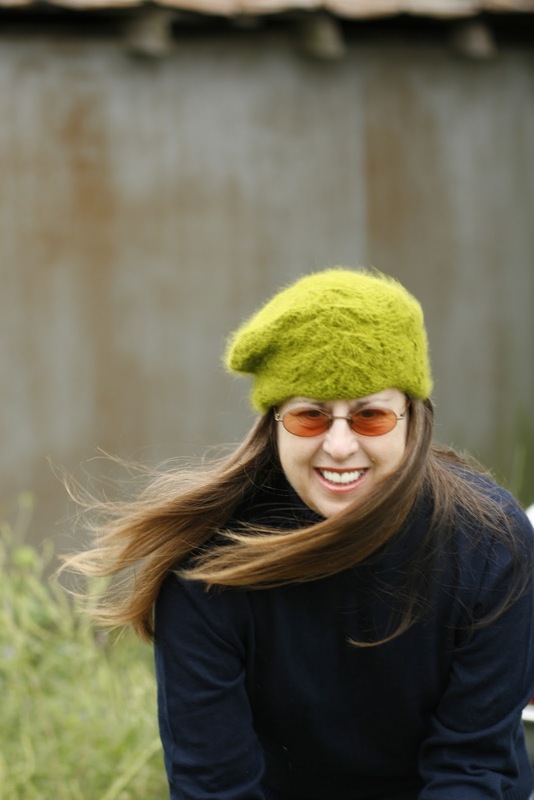 The pattern is called Lacey Leaf Angora Hat on Ravelry. It’s soft, it’s green, and it was a gift from someone wonderful. I sent the photo to my other friend Jan last night. You know when you get something new that you love and you want to show it off? Jan has been having a trying few days. 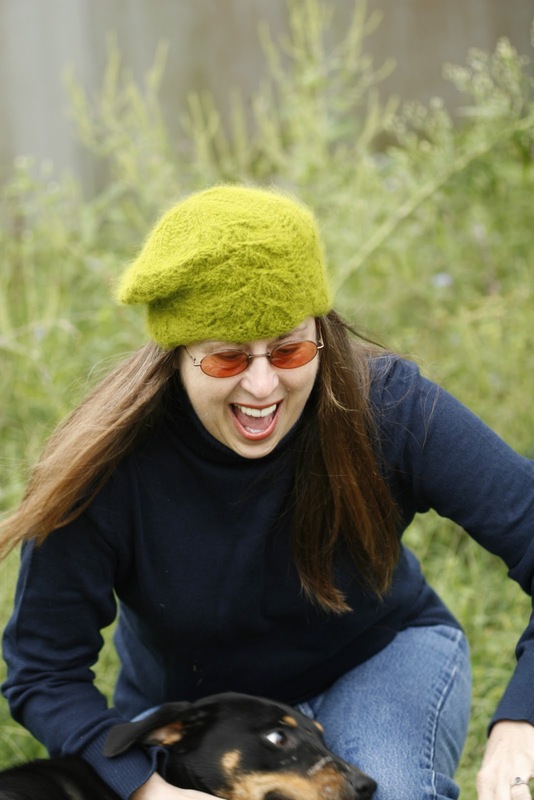 My hat and her trials spurred a blog post that you’ve got to read to believe. 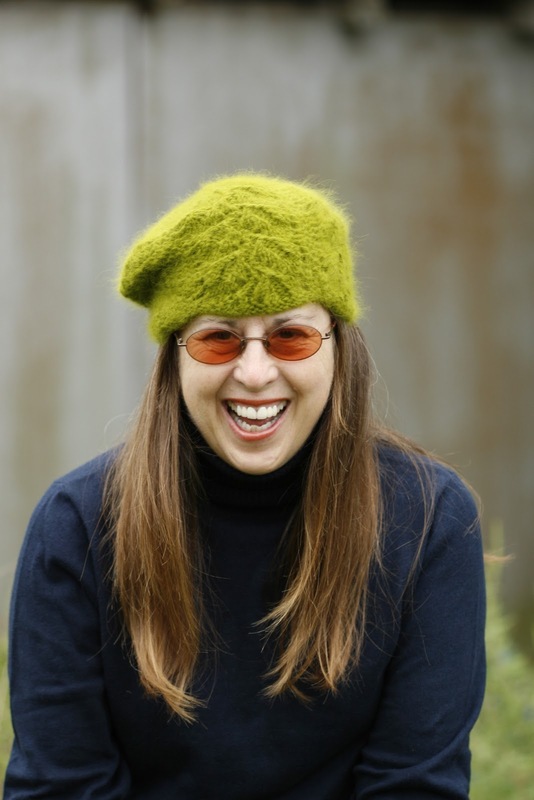 You can find Jan’s blog at Hungry Holler. This morning the temp outside was in the low 60’s. I’m blaming the arrival of autumn for my bout of startitis. What about you? Are you starting new fall projects? Going the extra mile (or trek across the farm) is worth every bit of effort. For days I’ve done nothing but work in the studio, not that working in the studio is a bad thing, actually it’s a wonderful thing. But tonight I had a harebrained notion to cast on a wee little diversion with the lovely handspun silk that I bought in Winfield. It’s only 160 yards over two itty bitty skeins. Really, that’s just a little bit of yarn right? I’ve decided on the Morning Snack Scarf pattern, which is really just a bit of faggoting. I think it’ll show off the lovely teal and green silk. 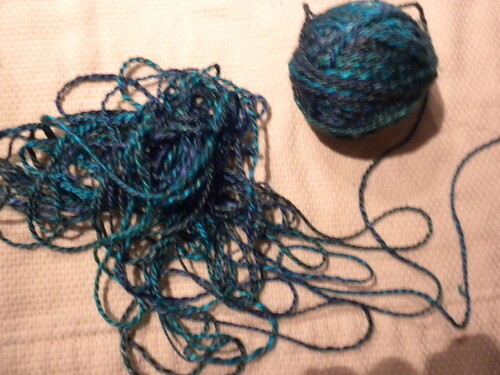 But I’m in for the night and walking across the farm to the studio to wind the yarn just seemed – excessive. It’s only 160 yards. Did I mention that? It’s silk. I mentioned that right? Uh huh. Yeah, you know what happened. Never think you can wind silk by hand. It’s worth the steps to get the swift. 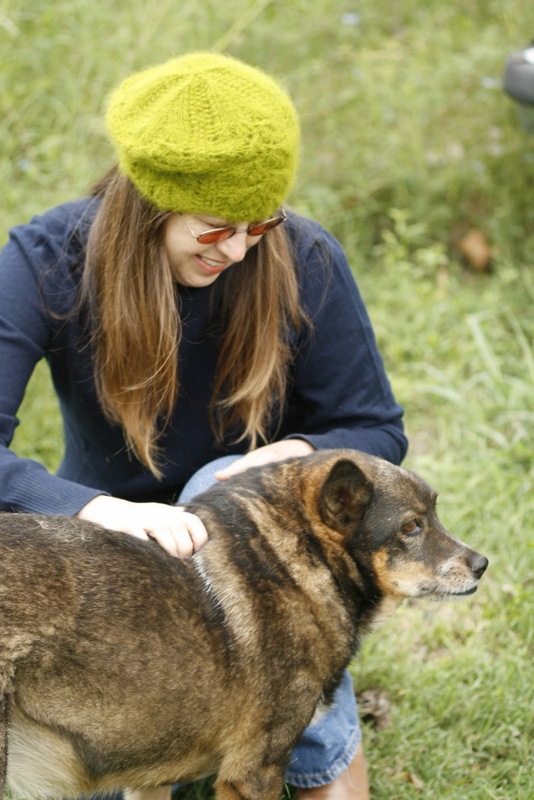 Winfield and an Equinox Yarn Giveaway! The Walnut Valley Guitar Festival was, as always, eventful. We arrived on late Wednesday afternoon and quickly sat up our tent in the vendor parking area. The sky began to darken and we thought we were wise to have our tent set up before the ran begun. We decided to skedaddle into Winfield proper for dinner and a few last minute provisions. As we pulled back into the park where the festival is held the tornado sirens began to blare. Then the rain began. Then the wind. Chris and I sat in the cargo van for a bit then decided to join the mass of people battling wind and rain as the raced to the safety of the grandstand. The grandstand was built of cinder blocks below the stadium seating and was our designated “safe place” to ride out the storm. I never heard confirmation but my security guard friend said two tornadoes were sighted in Winfield, both dipping down from the clouds but not touching down on the ground. It was scary. Chris and I both from Oklahoma and have known tornadoes all of our lives. This was the most frightened we’ve been. When the storm passed, clean up began. Bedraggled folkies and bluegrass lovers returned to campsites with downed limbs, canopies (EZ Ups) twisted and useless, and collapsed tents and a whole lot of standing water. Our tent was flattened but resurrected with only a few bent poles. Our bedding was soaked though, because being the clever girl I am, I had rolled out the thermarests and tossed the pillows into the tent before leaving for dinner. We heard some great music at Winfield despite the long days selling lavender and yarn from 10am-9pm. My friend Cathy (a Winfield virgin) and I walked over to Stage VII in the Pecan Grove to catch one of my favorite bands, Truckstop Honeymoon. Stage VII is an unofficial stage without amplification. It can be difficult to hear if you don’t get there early enough and have to stand way in the back leaning against a silver Honda. Since I know most of their songs, I was able to follow along. After closing shop one night Chris and I walked over to catch Mountain Heart on Stage 1. We had a good time and if you’re a bluegrass music lover, this is an energetic band you might enjoy. Time after time in our booth I was thrilled to see people pulling their knitting out their bags to show me what they were working on while at Winfield. This festival is a great place for public knitting! There was Gordon, who was working over in the hammered dulcimer booth but stopped to tell me about one of his knitting triumphs, I’d call it an opus. Gorden knitted a queen-sized bed spread on size 0 needles! And he had photos to prove it! It was stunning – I mean stunning! 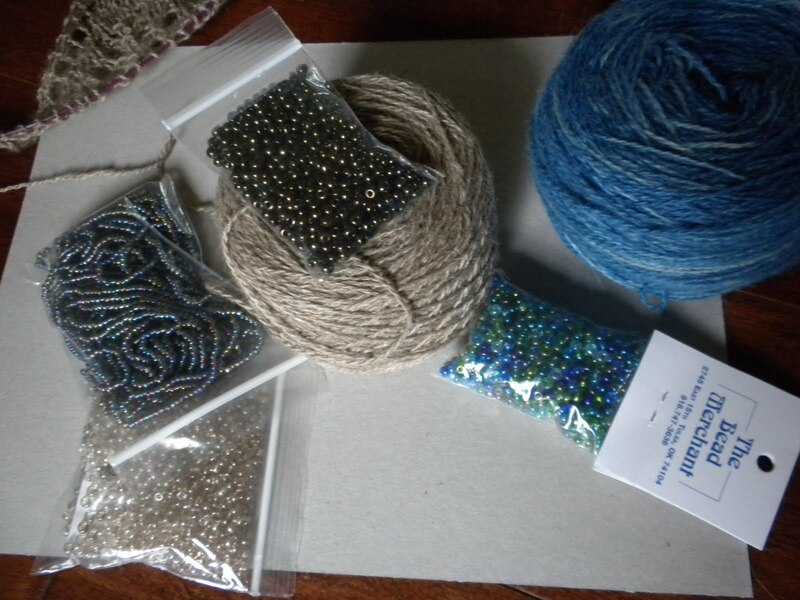 After taking forty years to complete the spread he is currently working on a lovely blue scarf with rich texture. 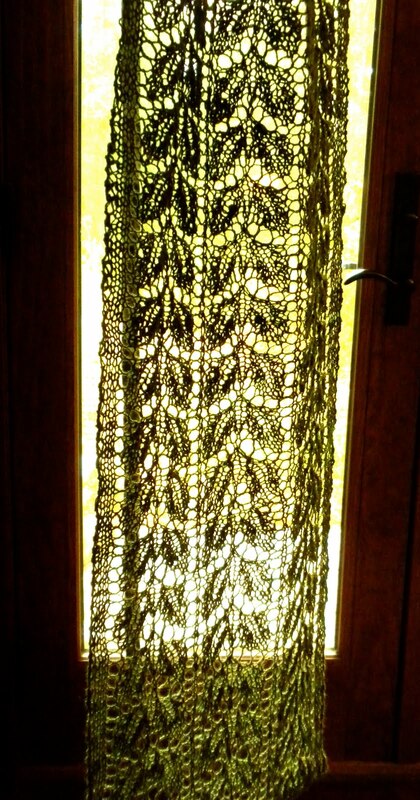 There was also Elise who I thoroughly enjoyed talking to about lace knitting. She bought some blue silk to make an Echo Flower Shawl and I can’t wait to see it finished! We arrived back at the farm late Sunday evening exhausted but happy. Sleeping in your own bed is a wonderful thing my friends. But there is no rest when one is facing a busy fall schedule. New yarn arrived yesterday and I’m already back in the studio dyeing like a woman possessed in order to be ready for the next festivals. Didn’t I say Yarn Giveaway in the title of this post? YES! Here’s the info on the yarn giveaway! 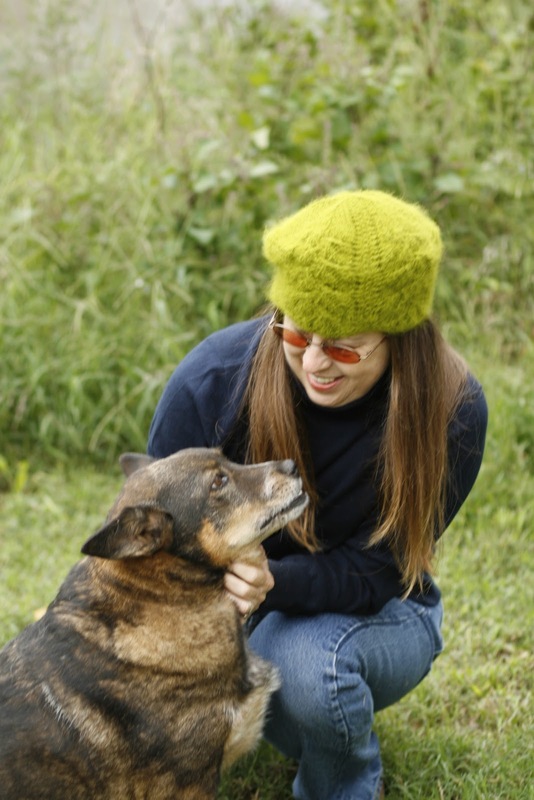 The giveaway is over – Congratulations to Katherine in Nebraska! We have several new colorways for Autumn, which officially begins with the Equinox on Wednesday September 23rd. It’s been a while since Lost City Knits has had a giveaway. This one is a bit different and will occur on our Facebook page. Here’s the skinny – become a friend of LostCity Knits (no space between Lost and City – link is on the sidebar of this page) and tag one of the designated Autumn Yarn Colorways photos with your name. The contest runs through Sunday night (midnight Lost City time). I’ll randomly choose a tagged name and make the big announcement on Monday. There will be three colors to choose from – Anything But Drab, Hearth, and Horseshoes with Van Gogh. 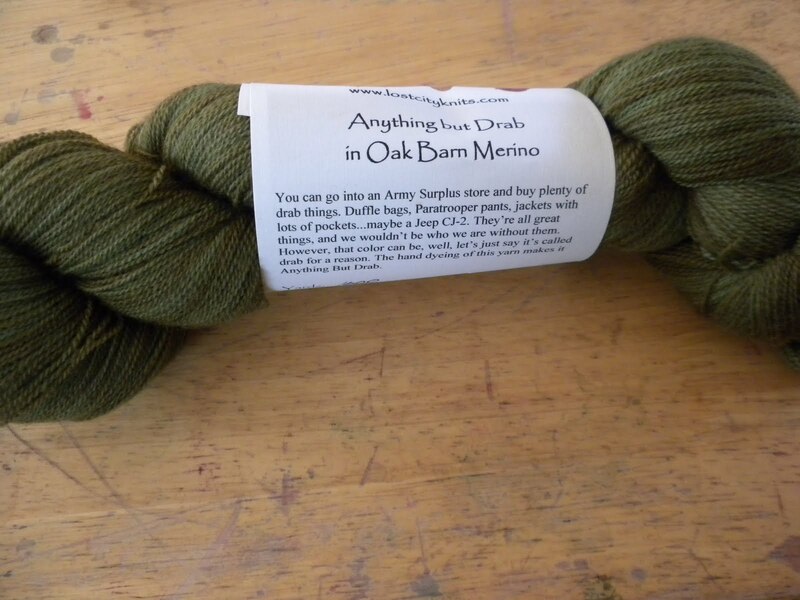 All are in our fabulous Oak Barn Merino 1000yds/90grams lace yarn. What you see are two colorways for fall. 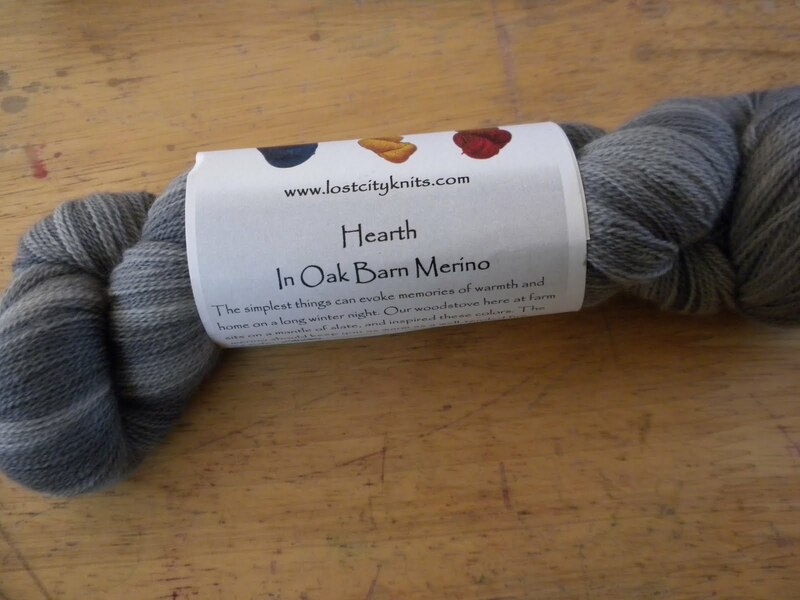 In the far back is Anything But Drab in Oak Barn Merino – that fabulous ultrafine merino lace yarn. 1000 yds/90 grams. 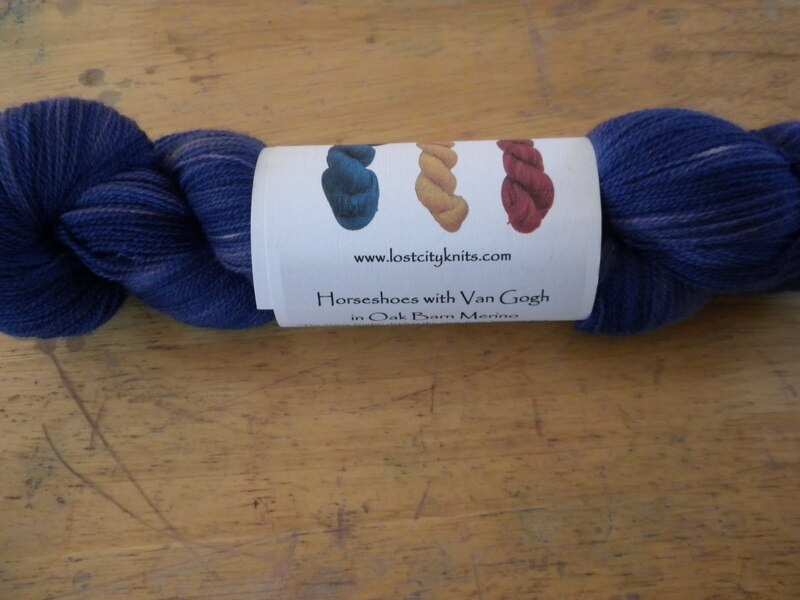 In the very front is our Wool/Bamboo lace blend in colorway Horsehoes with Van Gogh. 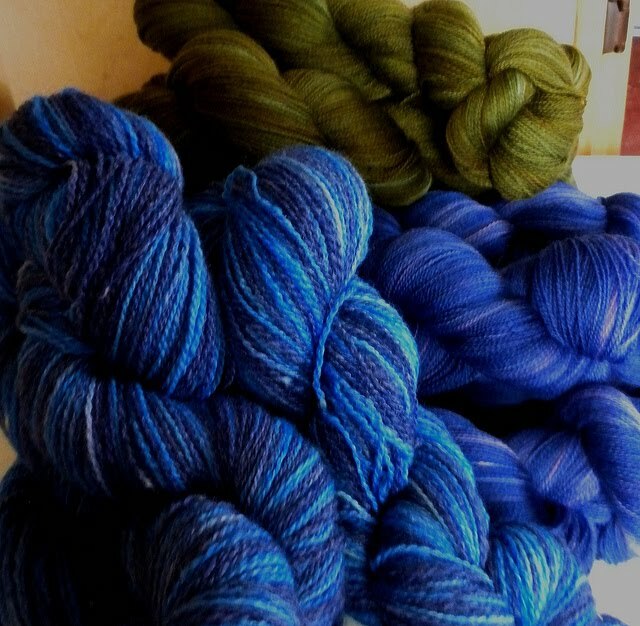 The center yarn is more of the Oak Barn Merino in Horseshoes with Van Gogh. “The Starry Night”depicts the view from Vincent Van Gogh’s room in an asylum in Arles, France. The bright moon ad swirling starts light a sky of a thousand blues. Here I attempted those blues, and have come close, which as we’ve been told, counts only in Horseshoes. While rushing to reskein the yarn to take the first dyelots with us to Winfield, I managed in a feat that cannot be recreated. I whacked my knee with the reskeining wheel as it was in motion (the wheel that is). Yes, the wheel was setting on the table at the time. Let’s just call it knitting aerobics that managed to bring the wheel in contact with my knee, which is normally well below table level. I promise none of the blood from my injured knee wound up on any of the yarn. These colorways, along with more fall offerings will be available online in the Oak Barn Merino next week. 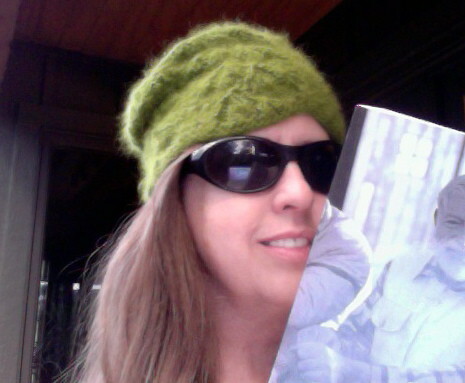 I was flipping through the newest LL Bean catalog yesterday during lunch. I love LL Bean, the quality is always good and the lines are quite simple. Not a lot of frill or flounce or gawdiness from these folks. Sure you have to be careful not to pick out the dowdy stuff, but I can manage that (most of the the time). Yesterday there was a problem though. During the winter I love to wear simple solid colored turtleneck sweaters. A lot. Almost daily some would say. They’re easy to dress up with a scarf or shawl. They look great under a blazer, a sporty jacket or my barn coat. They go nicely with jeans, cords, or skirts. If you’re tromping around in wellies, they’re good. If you go out to dinner and a movie, equally good. What’s not to love? LL Bean has all of their cotton/cashmere sweaters on one page in the new catalog. (Page 4 if anyone is interested.) Along the left hand side of the page are the color selections. I briefly scanned and picked out Coffee Bean, Camel, and Black Current. Scanning the colors again to see if there was anything I liked better I saw that there were two navy’s. I thought to myself, “what’s up with that?” I already have the navy, I bought it last time I ordered, but still why offer two? That’s when I saw that the top half of the colors were for the women’s sweaters, the second half for the men’s sweaters. The bright pink, fiery red, marine green, and turquoise are way more bright than I would wear – in a sweater that is. Sure I’ll probably wrap a colorful scarf or shawl – with beads even – around my neck or shoulders, but I’m just not comfortable in a bright top. I let my knitting provide the jazzy stuff. Does this mean I’m boring? Should I question my clothing color palette to insure that I still appear feminine? Or should I maybe write a nice little note to LL Bean explaining that women like a good brown too? PS Two new designs in the works, both with beads. One triangle shawlette is done in a lovely natural llama yarn in a soft beige with hints of gray (Blues Traveler for those who are familiar with the llama names). Chris picked out the perfect dark green beads at Bead Merchant for this one. It would have been fabulous with that Coffee Bean turtle neck from LL Bean.